It was June 10, 1900, dozens of Chinese Orthodox Christians had fled for their lives and hid in the home of their priest, Father Mitrophan Tsi-Chung. (who was ordained by St. Nicholas of Japan) A rebellion had broken out in China known as the Boxer Rebellion, an uprising against foreign influence which targeted all foreigners and Chinese converts to Christianity. Armed bands roamed the streets searching for foreigners to kill with the tacit approval of the imperial government. The group surrounded the home of Father Mitrophan and while some Orthodox Christians managed to escape, most of them, including the priest, were stabbed or burned alive. His body was found in his yard under a date tree. Father Mitrophan’s family shared in his witness for Christ: his son Isaiah was beheaded, his wife Matushka Tatiana initially managed to escape but was captured and beheaded on June 12 along with nineteen other Christians. The priest’s eight year old son John was brutally mutilated: his ears, nose and toes were cut off but he survived this ghastly attack. He was seen the next day begging for water. Passersby mocked him and called him a follower of devils. When asked if he was in pain he replied “It does not hurt to suffer for Christ”. The Boxers returned for him and finished him off. An Orthodox Christian woman named Ia Wang, the head teacher at the Orthodox Mission School, was also taken prisoner on June 10 and was stabbed, beaten and buried alive. A sympathetic neighbor picked up her tortured body and took her to his home where he nursed her back to health. The Boxers, when they discovered she was still alive, returned and tortured her to death while she had the name of Christ on her lips. St. Ia the Teacher is sometimes called St. Ia the Twice-martyred. The day of reckoning for most Orthodox Chinese was June 11, 1900. On the eve of that day leaflets were posted in the streets, calling for the massacre of the Christians and threatening anyone who would dare to shelter them with certain death. In the middle of the night gangs of Boxers with flaming torches spread over Beijing, attacking Christian houses, seizing Christians and forcing them to deny Christ. Some, terrified by torture and death, indeed renounced the Faith in exchange for life and burned incense before idols. Others, undaunted, confessed Christ. Their fate was horrible. They were ripped open, beheaded, burned alive. After that day search for Christians and killings continued: Christian houses were destroyed, people brought out of town to where Boxers&#39; temples were set up,interrogated and burned at the stake. 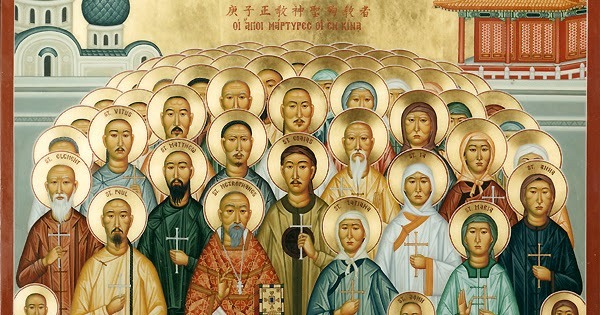 In all 222 Orthodox Christians received the crown of martyrdom, including Paul Wang, Clement Kui Lin, Matthew Chai Tsuang, Anna Chui and others known by name only to God. Churches were burned including the extensive Orthodox mission library, Orthodox schools and homes destroyed and the printing press smashed. Hundreds of Roman Catholic and Protestant Christians also shared in the martyrdom of the Orthodox. The Boxer Rebellion only ended when troops from eight nations, including the United States, entered China to defend their citizens and end the violence. The bodies of Father Mitrophan and the other Holy Chinese Martyrs were placed under the altar of a new church dedicated to their memory which was built in 1906. A cross was erected on the site of their martyrdom and the feast of the Chinese martyrs was first commemorated on June 10, 1903. Orthodox Churches were confiscated and destroyed, Orthodox Christians were martyred. The Church of the Annunciation became a circus, the cathedral of St. John Maximovitch became a stock exchange. The last Chinese bishop, Vasily Shuan died in 1962 and has never been replaced. The Orthodox Church of China had effectively ceased to exist. The sacred relics of these courageous men and women have not yet been found. But with the new, limited openness of the Chinese government there is hope for a continued revival of the Orthodox Faith in China. for you competed valiantly for Christ. you have received a crown from the Lord’s hand. pray for us who honor your martyrdom.